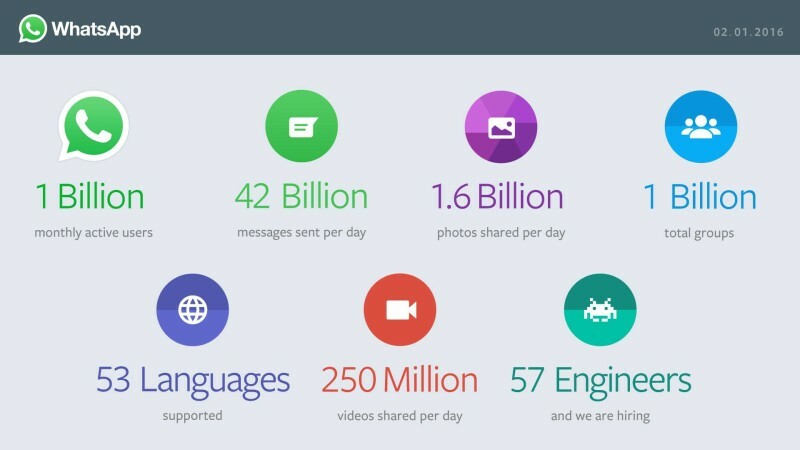 Facebook-owned WhatsApp has announced that it now has 1 billion users on its mobile messaging platform. 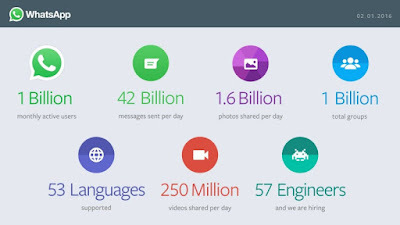 The company claims that people share 42 billion messages per day on WhatsApp, as well as 1.6 billion photos and 250 million videos daily. TMW reports this as quite an achievement by any measure. What’s perhaps more interesting is that CEO Jan Koum told Wired on January 18 that WhatsApp had 990 million users — which means the service added 10 million more in just over two weeks. WhatsApp added numerous features over the past year, including a desktop interface, voice calls and the ability to back up your chats to Google Drive. Video calling is believed to be in the works. The company also dropped the $0.99 annual fee that it rarely charged users in January, which begs the question: how will WhatsApp generate revenue? Unlike rival messaging apps, it doesn’t let users do things like hail cabs, book tickets and pay bills. It also doesn’t sell sticker and emoji packs. That said, WhatsApp’s massive global user base could give it an advantage over other messaging apps in just about any commercial venture it chooses to introduce.